In my previous life, back before I discovered Baja and surfing, I shared my life with two Rhodesian Ridgebacks (and a husband too, but he’s a whole other story). Their names were Kipling and Fletcher. I got Kipling in 1994 when she was eight weeks old, after visiting the breeder and meeting her “mom” and “dad” and being thoroughly impressed by their quiet strength and nobility. I took raising Kipling seriously – some who knew me then might even say obsessively – because knowing she would become a large and very powerful dog (brushing up against 100 pounds), I didn’t ever want her to get out of control. The result was a dog that was a pleasure to walk on leash, who came to work with me every day and slept quietly under my desk until something was amiss or I pulled out my lunch, who sat nobly beside me in the passenger seat of my truck, buckled in with her special doggie seat belt. And because I socialized her to within an inch of her life, she also loved everyone and greeted them with an adorable full-body wag that caught most people off guard. If she really liked them, she would try to go through their legs while doing the body wag, lifting shorter people up off the ground and giving several woman in skirts an unexpected thrill. 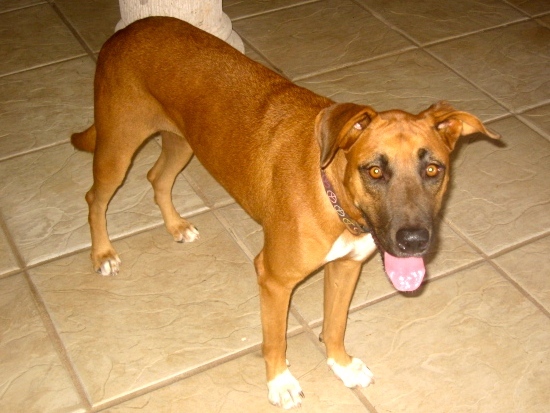 The best thing about Kipling, and I’m told Rhodesian Ridgebacks in general, is how discerning she was. She loved everyone with two exceptions. In both cases, they were strange men who proved to be up to no good. In both instances, she put herself between me and the man and growled so menacingly that it was clear they were not to come near me. 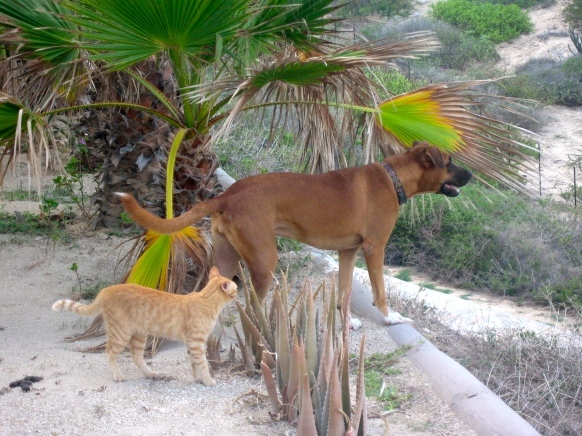 A Ridgeback conveys that they mean business like few other breeds. I’ve missed the sense of safety that comes from knowing your best friend has your back. When I left my husband and moved into my bachelorette apartment, Kipling came with me. But when I made the decision to move to Mexico I was faced with a dilemma – should I bring a large dog on a journey across two countries and on into a third where I didn’t know precisely where or how I would live? I wrestled with that question for some time before deciding that the best thing for Kipling was to return her to the home she’d shared with me, Fletcher and my ex for several years. I’ve always wondered if I did right by her, if we would have done okay down here together. I’ve missed her and every time I think about leaving her and the fact that I’ll never see her again, I tear up. In the past two years, I’ve lost four dogs to old age, two of them medium to large dogs who were excellent guards, barking what seemed like vicious warnings to those on the outside of the gate. They weren’t vicious dogs, but they did a good job acting the part and I believe took protecting me and this property seriously. Of the remaining three dogs, one is too old and infirm to fend off much more than a pesky fly; Peanut barks a good game when I’m home, but she purportedly stays in the garage if I’m gone; and Millie, while she might bark and nip at strangers when I’m home, like Peanut, does nothing if I’m away. I miss having dogs on the property who defend it consistently. So about a year ago, I started thinking about my Ridgebacks and how they are such excellent, discerning guards, and just big and scary looking enough to get people’s attention. A couple of months ago I went so far as to contact a RR rescue organization to see if they could help me adopt a Ridgeback that needed a home. No dice, they said, they can’t adopt out of country. I put the word out with friends and on Facebook in the hopes that someone would know someone who knew of a Ridgeback that needed rescuing. I even went so far as to consider the possibility of traveling to Jeffreys Bay at some point in the future to visit my buddy Derek Hynd (more on that later) and find a Ridgeback while getting some epic surf. Where better than the land where they originated to find one? And then, last Tuesday, I was at the veterinary clinic buying more meds for Doobie, when at the end of the transaction, I said to the vet, Dr. Felipe, “I’m looking for a dog…” Before I could say another word, he replied, “Follow me.” So I did. He took me to the shaded kennel area behind the clinic and from about 15 feet away pointed at a medium to large red dog in one of the dog runs. When we entered the area, she barked at us three times – a deep, resonate bark that would make anyone sit up and take notice. The cage she was in was under heavy shade, but I could see that she had a black muzzle and black-rimmed dark amber eyes, a large white blaze on her chest and white socks on her front feet. I held my breath a little and listened as Felipe began to tell me about her. “She has just started to bark when people come back here. She will make a good guard dog.” He said he believed she was part Mastiff. I was dubious because of her size and relatively fine facial features. 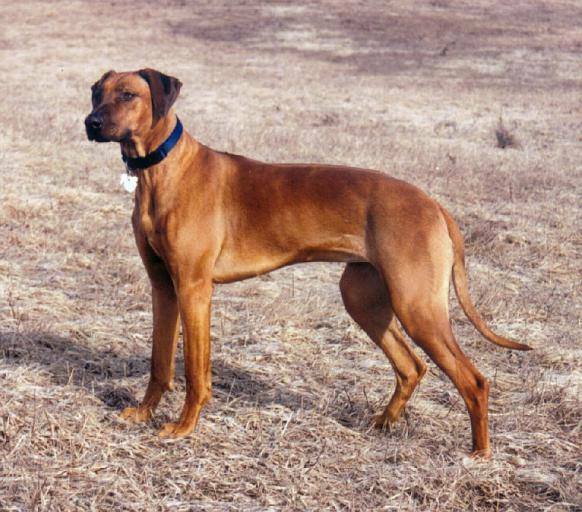 He said, “and she has some Boxer in her,” and then he said, “And some Rhodesian Ridgeback.” My heart did a little leap. He took me over to inspect her. “Look, she has a ridge,” he said. I looked at her back and saw nothing, but he directed me to look at her neck. And there it was – a circular whirl of hair just below the occipital ridge and a length of hair growing at odds to the rest of her coat that runs the length of her neck. 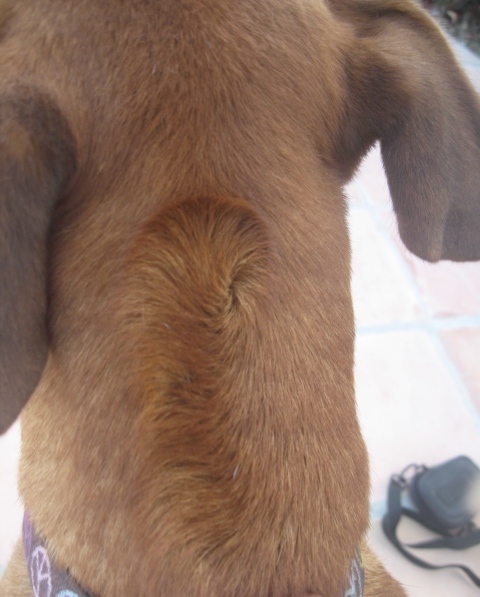 While it might not be up to breed standard (the ridge is supposed to start between the shoulder blades and run the length of the back), it most definitely is a ridge. I had to leave and return for her, so he had his staff bathe her, and when I returned and they brought her out to the waiting area, I was surprised to see how beautiful she was. I gave her some barbecue chicken I’d brought along as a bribe and was impressed at how gently she took it. Her friendly nature reassured me. The fact that she made it all the way home on the bumpy, windy road without any “incidents” further made me think I was doing the right thing by adopting her. To prove me further right, she promptly relieved herself when I let her out of the car. That night walking with her and the other dogs down the beach, I was astounded at how much she looks and moves like Kipling did. She has the same long, strong, sinuous body, beautiful deep red coat, and graceful gait. While she may be a little long and masculine in muzzle and her ears may not hang in the proper “houndy” fashion, I think there’s more Ridgeback in this baby than either Mastiff or Boxer. The hair on her head is as soft as velvet, just like Kipling’s, a tactile memory I’d long forgotten. Kali and Mochi checking out a horse grazing just outside the property. She’s fit into our home almost seamlessly, behaving like this has always been her home. After one night and a morning in the dog run outside (as much to give my dogs a chance to get used to her as the other way around), I quickly gave her run of the property. Her second night here I let her sleep inside because it was clear from the way she stayed so close to me that she wasn’t going to spook and take off. She lies a few feet away on the floor as I write this, legs outstretched, eyes half closed, trying, like the rest of us, to find some cool in the oppressive heat of a tropical summer afternoon. And I don’t know if she senses it, but to me, she feels like home. 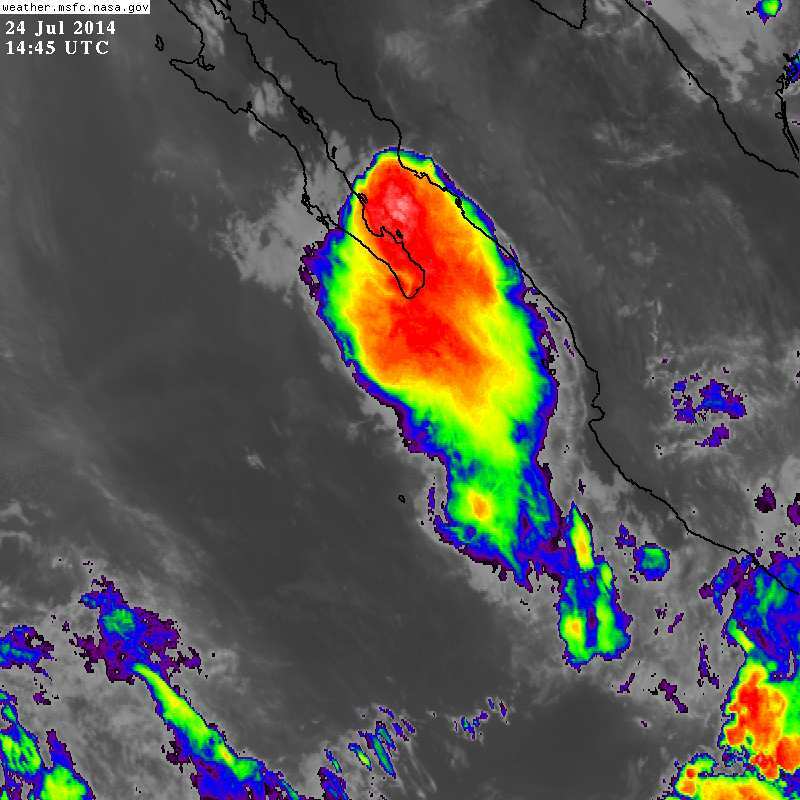 Satellite image of the storm’s intensity. The weather in Baja is gorgeous about 95% of the time. There are more blue-sky days here on average than most places on Earth. We get our fair share of wind in the winter, which is why this is such a great wind and kite surfing locale, but those are nice constant winds of between 15 and 25 miles per hour. Summer winds whipped up by warm tropical disturbances are different – they are meaner, stronger, and can wreak serious havoc when they exceed the 60mph mark. They are typically preceded by skies heavy with grey clouds and sometimes thunder and lightning. Fortunately, thanks to modern weather predicting technologies, we usually know when they are coming and can prepare our homes by putting up window-protecting storm shutters, removing delicate window screens, and packing all the patio furniture and garden decorations away in garages and bodegas for safe keeping. There is an energy of expectation and suspense that surrounds preparing for a storm. Perhaps that’s what I get off on, same as the adrenaline rush from surfing, that makes me embrace inclement weather. When I was a kid in Ontario, Canada and a big snowstorm blew up, I used to wrap myself in my father’s parka and walk through the streets of my small hometown buffeted by the wind. His coat reached mid-way down my calves and I had to wrap my arms around myself to pull it in and keep the frigid wind out. I think I felt more invincible in his coat than I would in my own snow gear, it was like he was there with me, his arms wrapped about me to fend off the weather. Icy snow flakes bit into the skin of my face and blew into the small space between my neck and the woolen scarf tightly cinched there. The sounds of the storm – the wind whipping along those otherwise quiet streets, through the trees so that their branches clicked and scratched out a dissonant beat, my boots crunching on the gathering snow drifts, the creak of icy power lines swaying overhead – accompanied me on my trek past small houses nestled into deep snow drifts. I relished the cold biting my nose, the sensation of ice crystals growing from the tips of my eyelashes, of cold air rushing into my mouth and down into my lungs. I’d walk the perimeter of our town in the dark of an early winter evening, the streetlights catching the flash of so many snowflakes flying about wildly in blasts of a northeast wind. I approached rainy days in summer similarly – I would walk the streets of my town or the dirt round that defined the circumference of the lake where we had a cottage, getting soaked to the skin, shoes squishing, my socks falling from the added weight of the water they’d absorbed, gathering around my ankles. If it was windy, those rainy days almost made me feel as alive as a stormy winter night did. I embraced the power of the wind. Living at the tropical end of the Baja Peninsula could challenge the most ardent lover of wind not to forsake their love for calmer locales. The other day we had an unexpected chubasco (storm) come through in the early, soft lit hours of the morning. Aside from some thunder and lightning that woke me at 4:30am, the storm front hit with little warning at 6:40am. The sound of the wind wailing through window screens and the patter of large rain drops hitting the tiled patio outside my bedroom door roused me out of a sound, dream-filled sleep. In the time it took me to haul my still sleep-drenched body out of bed and wrap myself in a sarong, a howling gale had blown up out of nowhere. As I hurried down the stairs to gather patio furniture cushions, the wind grabbed my sarong, yanking it off with surprising force. I pulled it back around my chest in vain, the wind lashing out and ripping it off once again. I threw it on the dining table and ran naked about the house battening down the hatches. The dogs, spooked by what were now 60 to 70 mile per hour winds, did their best to trip me up as I went from door to door to window, closing and latching them against the onslaught of wind and rain. The interior of the house looked like a wind tunnel experiment – papers and magazines were flying everywhere, window blinds flapped madly. Relief washed over me when Doobie, the senior member of the dog pack, padded up as quickly as her arthritic legs could carry her while I collected the cushions from the patio furniture. There was no time to get the patio furniture inside. I knew I had to pull the three sliders leading to the ocean-side patio closed NOW. But the largest one refused to latch – the force of the wind bent it so the two sides could not make contact. I left it and ran to close the windows upstairs. When I returned to the living room, the wind had picked up another notch and ungodly sounds were coming from the unlatched door. It groaned and creaked in protest as I watched it bend and bow in response to the force of the wind. I pictured it exploding in a cloud of dagger-like shards and, in response, retreated to the garage, herding the dogs along with me. From the garage I heard a plaintiff meowing, a distress call from the bushes just outside the leeward side of the house. Responding to my encouragement Mochi the cat shot across the driveway and into the garage, managing somehow to escape getting soaked despite the huge rain drops that now pummeled the driveway. Even Mochi seemed to understand that the living room was a high risk zone and remained in the garage with the rest of us. The wind slammed and shook the garage doors in a cacophony of metal on metal and the rain began to pour from the gutters in a torrent. Ungodly sounds were emanating from the house – moaning and groaning and howling her protests against the force of the wind. I’m not sure how long we waited, but the wind soon weakened enough that I felt safe returning to the living room to try to close the slider once again. With a great deal of effort and several tries I managed to latch it, relief washing over me. A large puddle of water had gathered inside the three sliding glass doors – the rain forced through the tiny space between the doors and their tracks. As I mopped up the water, I felt the sting of wind-blown sand hitting my leg and discovered that the wind had also unseated one of the sliders and opened a quarter-inch space between the frame and the door. Amazing! Those doors are heavy! Fortunately, the storm only lasted a couple of hours, but she managed to wreak some serious havoc all along the coast nevertheless. Here three screens were bent and torn off windows, several others tweaked out of shape, the screens stretched and pulled from their frames. The cover for the barbecue is MIA. It was weighed down with three heavy clay floor tiles, but the wind must have got under it, threw the tiles to one side and launched that heavy cover like it was a plastic grocery bag. It’s out there somewhere in the desert. My neighbors had palapas torn apart or knocked over, roof tiles ripped off, gates and unlatched doors pulled from their hinges. Coconuts and fronds turned to ballistics, felled from palms in a frightening volley. It’s amazing no one was hurt. In the cleanup afterwards, we found sand everywhere. Sand blew into every crack and crevice, collected in large volumes all over the patios and as high as the second story. It blew so hard, it blasted the paint right off the metal gate to the beach. In my twelve years living here at the southern tip of Baja, I’ve never before experienced a storm of this magnitude come up so quickly. So while I do love inclement weather, I prefer the kind that comes up slowly, with warning, and time to prepare. And the feelings I have towards hurricanes lie somewhere other than in the “love” spectrum. We’re in the thick of hurricane season now and with sea and air temperatures higher than we’ve experienced in several years, it bodes to be an active one with storms continuing to form well into October. I beseech Mother Nature, keep those Category 4 hurricanes well out to sea this year.